Visualization has been a major part of the research activities of our Institute over the last 25 years. The vis-group performs basic and applied research projects in all areas of visualization (scientific visualization, information visualization, visual analytics) and visual computing. 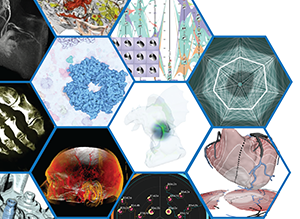 In this research area, we develop new visualization techniques to support biologists in data analysis and create visualizations to disseminate scientific discoveries in biology. In this research area, we develop rendering methods that are inspired by scientific illustrations, in order to make complex biological information more intuitive to understand and more pleasant to read. In this research area, our focus lies on novel visual encodings and interaction techniques to explore a large amount of abstract data, often in combination with analytical reasoning. This research area bridges the gap between visualization and medicine by providing comprehensible visual means to detect diseased regions or to aid clinical treatment decisions. In this area, our research focuses on understanding and using the capabilities of human perception for better comprehension of displayed data. This research is directed towards visual parameter space analysis, 4D analysis of time varying XCT data, visual analytics of segmentation ensembles, comparative visualization of volume ensembles as well as parameter space analysis of segmentation pipelines. Last update on 4. May 17. Comments to edi (at) cg.tuwien.ac.at.